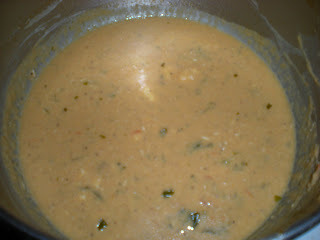 This soup was done by my Mexican friend Mon on the last Friday cooking, it took me a while to get the recipe from her. In this recipe, she made the tomato sauce herself one day in advance, if you think it is too much work or do not have a juicer, feel free to use Clamato juice. 1. In a juicer, add tomatoes, pepper, celery, parsley and onion. 2. Mix in lemon juice and mayonnaise to the tomato juice. 3. 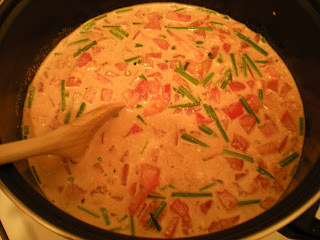 In large soup pot, boil diced tomatoes, chives and tomato sauce/Clamato juice over medium-high heat. Cover and simmer for 30 minutes. 4. In a blender, puree the soup mixture along with basil leaves. 5. Return the puree to soup pot over medium heat. Mix in cream and butter to soup. Stir oftenly until the butter is melted. Do not boil. Season with salt and pepper and serve.